The last thing most 14-year-olds want to do is stand before a judge. But eighth-grader Danielle Rice, pictured above, and 39 of her middle school peers relished the opportunity this past spring. Rice was one of 40 students from four Midlands-area middle schools (W.A. Perry, Hopkins, Heyward Gibbes and Alcorn) who participated in the University of South Carolina School of Law’s first-ever Middle School Mentoring Program. It was a chance for them to learn how the law is relevant to their daily lives. And for Danielle Holley-Walker, former associate dean for academic affairs, it was an opportunity to spark the students’ interest in careers in law. Holley-Walker is one of this year’s class of Liberty Fellows, each of whom is charged with creating a service program that engages multiple educational institutions. She and a team of eight law students built the program, which included one-on-one mentoring and educational workshops that helped the middle school students learn how to build a case and advocate for a cause. 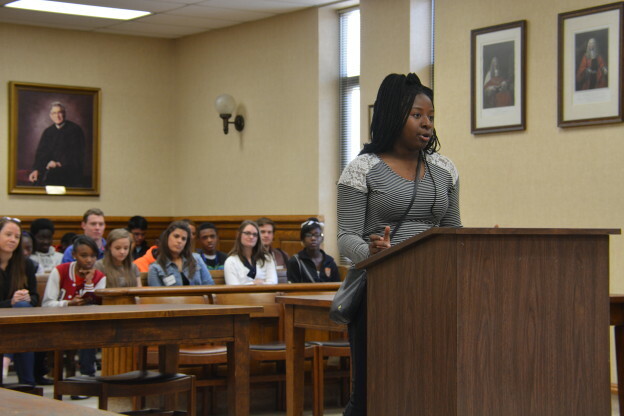 The program culminated with oral arguments before a real judge. With the agenda in place, more than 40 law students were recruited to serve as mentors, while principals from each of the participating middle schools selected 10 students to take part in the program. Beginning in January, the middle-schoolers came to USC to meet with their mentors for the first time and learn about the problem on which they would focus during the coming months: should public school uniforms be mandatory? On March 21, arguments in hand, the students sat in the second-floor law school courtroom and waited their turn to go before Judge Michelle Childs. A 2010 Liberty Fellow as well as a 1991 law school alumna, Judge Childs not only heard the arguments but also provided each student with tailored feedback. Law student mentors and middle-schoolers alike agreed that they gained tremendously from this experience. “One of my favorite parts of this is getting to meet all of these new people. I have new friends that care about the same things I do,” Rice said. While the first Middle School Mentoring Program has concluded, there are high hopes for the future. Visiting Assistant Professor Claire Raj, who ran a similar program at Howard University School of Law, will take the reins of the program, and even explore the potential for expansion with a future summer camp program. “We need to start preparing these kids for the future as early as middle school. We are opening a door of opportunity and hoping they walk through it,” Raj said.